Cantillation is a chorus of professional singers - an ensemble of fine voices with the speed, agility and flexibility of a chamber orchestra. Formed in 2001 by Antony Walker and Alison Johnston, it has since been busy in the concert hall, opera theatre and the recording studio. Performances have included Adams' Harmonium and Transmigration of Souls, the Australian premiere of Sofia Gubaidalina's Now Always Snow , Ross Edwards Symphony No. 4 'Star Chant', Haydn's Nelson Mass and Jonathan Mill's Sandakan Threnody (all with the Sydney Symphony); Nigel Butterley's Spell of Creation (Sydney Philharmonia), Mahler Symphony No. 8 (Melbourne Symphony), concerts with Andrea Bocelli and most recently concerts with Emma Kirkby and Orchestra of the Antipodes in Sydney and Melbourne, and regional touring throughout NSW (both for Musica Viva), and performing in the Sydney Symphony's Shock of the New program for the second year running. 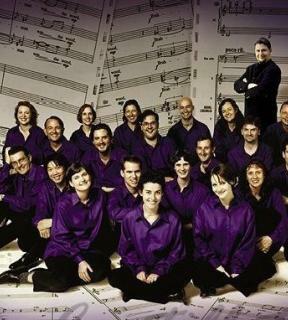 As well as opera appearances (Semele, The Fairy Queen, Orfeo and Dardanus), Cantillation has sung for the Dalai Lama, recorded all the anthems for the Rugby World Cup (and performed at the opening ceremony) and recorded soundtracks for several movies, including in the Emmy nominated soundtrack for Christopher Gordon's Salem's Lot. Cantillation's performance of Allegri's Miserere was used by Bangarra Dance in Clan, seen around Australia in 2004. In 2006 Cantillation sang with the Sydney Symphony in Rachmaninov's The Bells, and performed in Pinchgut Opera's production of Mozart's Idomeneo.